than in the higher energy state. To achieve magnetic resonance, it is customary to leave the frequency f of the electromagnetic oscillations fixed and to vary Bex• until Eq. 41-22 is satisfied and an absorption peak is recorded.Nuclear magnetic resonance is a property that is the basis for a valuable analytical tool. particularly for the identification of unknown compounds. 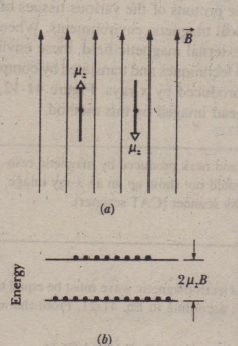 shows a nuclear magnetic resonance spectrum, as it is called, for ethanol, whose formula we may write as CH)-CH2-OH. The various resonance peaks all represent spin flips of protons. 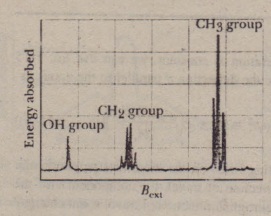 They occur at different values of BeXi however, because the local environments of the six protons within the ethanol molecule differ from one another. The spectrum of Fig. 41-11 is a unique signature for ethanol. Spin technology, called magnetic resonance imaging (MRI), has been applied to medical diagnostics with great success. The protons of the various tissues of the human body are situated in many different local magnetic environments. When the body, or part of it, is immersed in a strong external magnetic field, these environmental differences can be detected by spin-flip techniques and translated by computer processing into an image resembling those produced by x-rays. Figure 41-12, for example, shows a cross section of a human head imaged by this method.